All volunteers are required to obtain a Criminal Background Check (Section 1-111 of the Pennsylvania Code – Act 34) and a Child Abuse Clearance (Sections 6354-6358 of the Public Welfare Code – Act 151). If you have not resided in Pennsylvania for over ten years you will also be required to obtain a Federal Criminal Background Check. 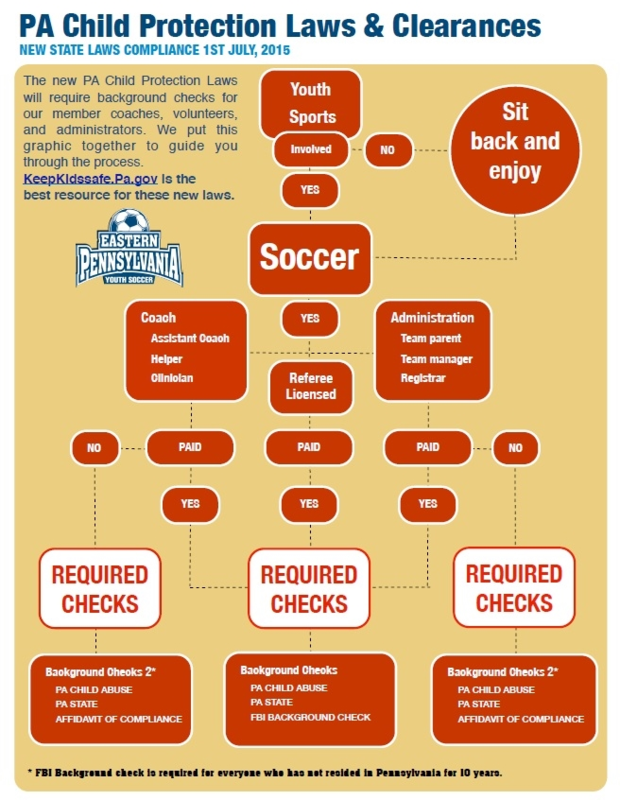 Risk Management Application: Each soccer year all GMSC coaches must submit a Risk Management Application through our state affiliate, Eastern Pennsylvania Youth Soccer Association (EPYSA). Criminal Background Check: can be applied for from the Pennsylvania State Police website. Child Abuse Clearance: can be applied for from the Department of Human Services website. The Child Abuse Clearance is free, once every 57 months or requires a $8 payment otherwise. FBI Federal Criminal History Records – the fingerprint-based background check is a multiple-step process. The applicant must register first prior to going to a fingerprint site. Registration is completed online. The location of the fingerprint sites and day and hours of operation for each site is also posted on this website. For additional information below is information provided by EPYSA our governing body as well as GMSC, Inc. follows the GMSD standards on volunteering. A zero tolerance policy has been implemented for any criminal and/or child abuse clearance negative findings. GMSC additonally reserves the right to review all candidates for volunteer positions through the public US Justice portal. Volunteers requiring clearances are those “acting in lieu of a parent” or having direct or indirect contact where they provide care, supervision, guidance or control of children or have routine interaction with children. An FBI Criminal Background Check if you have not been a continuous resident of Pennsylvania for 10 years, applies to paid employees and contractors. Volunteers between the ages of 14-17 are NOT required to have clearances. All adults (within the context of the new laws) are “mandatory reporters.” Volunteers are not required to have child abuse training or certification, although it is recommended. The clearances are good for 36 months. They are portable and may be used with other organizations. We will continue to refine our state risk management policy as the laws and compliance continues to evolve. Our current standards for disqualification will remain in accordance with US Youth Soccer and US Soccer policy: conviction of a felony, crime of violence or a criminal offense against a person. The state association reserves the right to institute stricter guidelines and additional clearances. All organizations will be required to affirm their compliance with these laws. For travel programs, all adults who seek to be placed on a roster will continue to register themselves through our risk management portal. Adults who have not obtained their clearances will not be placed on a roster. We will continue to work with members of the state legislature to refine the laws and procedures to reduce unintended consequences and enhance the safety of our children. We recommend that you visit with your local state representative as well. If you have further questions, we will assist as best we can but will also refer you to the appropriate authorities. Again, for more in depth information, please visit www.keepkidssafe.pa.gov.